In Stock - Order before 4pm to ship same day Mon-Fri.
Alien UPGRADED. INCLUDES THE NEW 2018 SMOK TFV8 BABY BEAST TANK! The Smok Alien 220W Mod has dimensions of 85mm x 44mm x 28.4mm making it very compact and portable for a box mod that puts out a massive 220W. The UK Smok vape kit comes as shown (NOW WITH BABY BEAST) and also allows you the freedom to personalise your own Smok Alien Kit by using your current favourite tank or selecting one from our suggestions. Buyers Beware, there are a lot of Smok clones - if it's too cheap is it too good to be true? The Smok Alien screen features an easy-to-read menu and features 6 info-lines that show wattage, mode, dual battery indicator level for each cell, resistance, coil type, puff time and number of puffs. At the top of the Alien, there’s a 510 connection and on the side, the oversized hidden fire button is beautifully integrated into the design. The shell is contoured for a very smooth to the touch feel and the Smok Alien is easy to operate using a well designed combination of USB port, OLED screen and function buttons. This UK mod gets its 220W of power from dual external 18650 batteries installed behind a magnetic battery door. Don't forget to select the buy-option if you want your Smok Alien with UK batteries. To top-up the batteries, you can charge them externally or you can use the on-board charging setup by plugging the unit into any USB wall outlet. In addition to power mode, there are also several temperature control modes that support nickel, titanium and stainless steel coil heads. Our Smok Alien mod only UK kit (now with Baby Beast tank) option gives you flexibility and the choice to combine it with your favourite tank. All in stock. The Aspire Cleito Tank features a new design whereby the chimney section of the tank has been removed completely and replaced with the coil itself. What this means is there is nothing between you and the coil as it were, and therefore flavour production is better than ever and the airflow is immense, truly wide open, with three cyclops style slots in the airflow ring at the base of the tank. At the Vape Expo 2016, the Cleito received best Tank award. The Smok TFV8 Baby Beast Tank is the a smaller form factor of the TFV8 Big Baby Beast, featuring 2 ml juice reservoir, precision airflow control, signature hinged top-fill system and introducing the new Baby Turbo Engines coil structure. Add this to your Alien mod only purchase and get the perfect partner. The Smok BIG Baby beast is slightly larger than the Baby Beast. More vapour, more flavour in a slightly larger form. Note: This is a sub ohm device, generally use only 0.3 or 0.6 mg strength nicotine. Your device is manufactured with precision so will not leak providing you use the product and parts correctly. Where any leaks have occurred, we have solved almost all by taking the following steps. Ensure you have the correct temperature/power settings for your particular device. Coils for example have ratings and should be kept within maximum and minimum recommended settings. Too high and your device will pop and crackle which may cause spots of e liquid to escape via the air-intake. Where product has been returned, we have found that TIGHTENING the PIECES properly resolves any leak issue. Smok is a leading brand of electronic cigarettes which specialises in the manufacture and research of vape products. As a result of Smok's ability to innovate with new developments and patented products, the company is known as a sector leader in variable wattage and temperature controlled vape mods and e cigarette devices. Not only is the Smok Alien one of the best selling Vape mods world-wide it also features as probably the best vape mod in most independent Smok Alien Reviews. Smok was founded in 2010 and is based in Nanshan district Shenzen City, a major worldwide hub of the electronic cigarette supply chain. 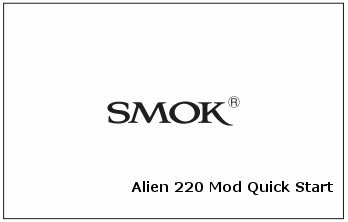 The introduction of the Smok Alien firmly puts Smok on the map as a major player in high spec. power-vape devices. The Smok Alien is the UK's leading high-spec vape mod. This kit is perfect for beginners like me, who has tried other starter kits but this one far the best yet. A great piece of kit, a smooth, tasty smoke and feels quality. The tank is too small at 2ml. It requires filling up regular, at least 4 times a day and probably the cause of the coils burning out very quickly. First coil lasted 4000+ puffs TFV8 Q2, 2nd only about >1000. The seal O ring gasket needs replacing already and just ordered a 7ml tank. My other issue is for the price I was expecting the batteries to be included, unit useless without them. But included them in the purchase just incase but the battery life is extremely good. Beware, there are no user instruction manual, so do your research first. You are never going to lose it !!! Purchased this as a family member was already using the same also thoroughly researched to find one that would help me become totally "cigarette free". This is definitely the amswer, lovely price if equipment tho still getting used to its weight, size & shape as was using pen style before. One tiny niggle, mouthpiece doesn't sit tight in tank. I tried to fit one of the o-rings thinking this might be the problem but none fit, so I need to be extra careful it doesn't come out. I don't really want to send off for a backup tho of course if I lose it I'll have a wait for a replacement. My family member does not have this problem with here, could it possibly be a manufacturing glitch or such? I had before vype, and always struggling with leaking and battery, but smok is the best .